Hole number 7 is a par 3 of 132 metres. 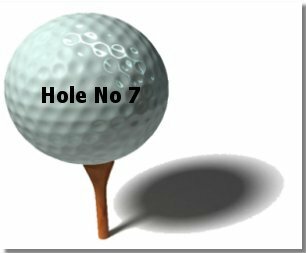 It is stroke hole 7 for men and 7 for women. From the No 7 tee, players generally use a medium iron to hit across a small gully area and onto the small green. The fairway on the left is flanked by pines which are a hazard. The fairway slopes to the left and in dry weather the balls will often track down into the pines on the left. Smart golfers aim to the right and look to run the ball onto the green.